A time-honored high school baseball team in the Tohoku region, which has played three times at the summer national tournament at Koshien Stadium, played its last game earlier this month. The baseball team of Futaba High School in Fukushima Prefecture has a history dating back more than 90 years. Since the 2011 Fukushima nuclear disaster, the school, which was located within the evacuation zone, has been holding classes at facilities outside the zone. As the number of students has fallen sharply, however, it has been decided that the school will be closed next spring. Last weekend, I watched the team’s final game at a stadium in the city of Koriyama. Two third-year students at Futaba High School played in the game on a joint team with another school. Many former members of the Futaba High School team cheered for their juniors in the stands in a pouring rain. Yukio Ishida, 54, was among the cheering spectators. For five years and four months since he fled his home in Okuma, Fukushima Prefecture, Ishida has been living as an evacuee. Now, he is doing a decontamination-related job. Thirty-six years ago, Ishida played in the summer high school baseball tournament at Koshien Stadium in Hyogo Prefecture as a shortstop for Futaba. His team won a come-from-behind victory in its first game. If it had won the next game, the team would have played Waseda Jitsugyo, whose reputed ace, Daisuke Araki, later joined the professional baseball ranks, Ishida said with a boyish smile. His younger brother and two sons also played on the Futaba High School baseball team. As Ishida was watching, the last members of the school’s baseball team were trying to tie the score in the top of the ninth inning. Ryuji Matsumoto advanced to third, but overran the base as he slipped in the mud and was tagged out. The game was over. Futaba High School was founded in 1923. Its more than 17,000 graduates include many people who have supported the local communities as employees of the local government or local assembly members. Had it not been for the devastating accident at the Fukushima No. 1 nuclear power plant, which formerly was the backbone of the local economy, students would be still celebrating the joys of youth at the school, studying, doing club activities and falling in love. Driven by a desire to keep the legacy of the baseball club alive, a group of former members formed a baseball team at the end of last year. They are now training with a goal of playing in the Masters Koshien, an event for Koshien veterans. 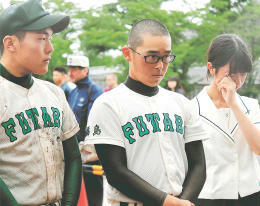 Encouraged by the performances of the last members of the Futaba High School team, the former players will keep working to take the tradition into the future.